On occasion I feel compelled to knock a movie because it tries too hard to span genres, though I don’t do so because I believe that films should stay firmly locked into their various varieties. Indeed, when done well, a flick that doesn’t firmly reside into one field or another can be pleasing and worthwhile. The problem is that few movies succeed in that regard, and most that try to bridge gaps come across as muddled and erratic. For example, Crazy In Alabama attempted far too much, and it did none of its types well. Most movies that work across genres really should have picked one and stuck with it. 1986’s House falls into that category. 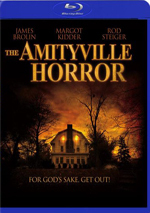 It offers a fairly early example of a comedic horror flick, but it succeeds neither as a scarefest nor as a laughathon. In the end, the movie seems like a somewhat confused and dated piece that does’t do much for me. Successful novelist Roger Cobb (William Katt) returns to the house where he lived in as a child. His aunt helped raise him, but she just committed suicide, and Roger inherited the place. Troubled by the mysterious disappearance of his son - which occurred in his aunt’s house - and still coming to grips with his divorce from TV star Sandy (Kay Lenz), Roger decides to move into the house. Apparently he figures that perhaps renewed residence will help him figure out what happened to his boy. Roger also hopes that he’ll be able to write again. Roger suffers from writer’s block, and he can’t get his autobiographical tale of his experiences in Vietnam off the ground. Added to the issues to his list of concerns, Roger remains distraught over the fate of one of his war buddies. After Roger moves in to the place, he discovers some strange supernatural episodes, and he starts to believe these may be connected to his son’s disappearance. Ultimately his Vietnam experiences tie in to the affair as well as the plot becomes even more complicated. There’s nothing wrong with a comic horror film per se, and the haunted house concept featured in House was certainly ripe for some gags. However, House includes too much material that doesn’t fit the lighthearted treatment. The movie uses some themes and topics that could become intense if the filmmakers chose a more harrowing path. Frankly, I think that’s what they should have done. With that approach, House could have been a decidedly disturbing ride, and the subject matter really makes more sense within that style. Suicide, divorce, missing kid, dead friend, man on the verge of a nervous collapse - does this sound like material ripe for a light touch? No, but that’s the method behind House. Would House work better if it took a more nightmarish approach? Perhaps not, as the talent behind it might not rise to the occasion. Director Steve Miner defines the notion of the journeyman filmmaker who plods along from one inconsequential flick to another, and Katt seems to be badly miscast as Roger. He brings no substance to the role’s psychological demands, and he lacks any comic flair that might make the lighter scenes fly. Even George Wendt as Roger’s neighbor Harold fails to bring any life to the proceedings. Harold acts like Norm from Cheers, so one would think Wendt would do well in the part. Perhaps the character was too familiar, for Wendt sleepwalks through the film. Frankly, I remain surprised that I find so little to like during House. I saw it when it first appeared back in 1986, and from what I recall, I thought it was a fairly entertaining flick. However, 31 years after that, I clearly feel differently. House tries to be a fun and lightly scary romp, but it takes on subjects that don’t fit that style. It bottles up a disturbing and horrific tale that House buries under fluff. House appears in an aspect ratio of approximately 1.85:1 on this Blu-ray Disc. Given the movie’s age and origins, this became a pretty good presentation. For the most part, sharpness worked fine. Some wider shots looked a little soft, but the majority of the movie appeared reasonably accurate and tight – this wasn’t a razor-sharp film but it seemed more than acceptable. House featured a fairly subdued palette, and the colors looked adequate. I thought they could’ve been more vivid, but they were mostly good, and at least they lacked the murkiness that affects so many 1980s movies. Black levels seemed to be pretty dense and dark, and shadow detail was clean and natural. Nothing about the image excelled, but I thought the transfer offered a nice representation of an older, low-budget affair. Though the film boasts a new DTS-HD MA 5.1 remix, one shouldn’t expect much from it. For all intents and purposes, this became a “glorified mono” track that failed to use the channels to much advantage. Honestly, I’d be hard-pressed to identify any notable usage of the side or rear speakers. Music spread out in a broad manner that lacked obvious stereo presence, and effects fell into the same category. While these elements moved outside of the center, they did so without any clarity. That felt like a disappointment, as the movie enjoyed a number of good opportunities for lively audio. The Vietnam flashbacks could’ve created a dynamic presence, and the scary sequences came with the same potential. None of these managed to provide a soundscape that expanded past the monaural impression to an obvious degree. Audio quality seemed fine for its age. Speech could be a little flat, but the lines lacked edginess and seemed perfectly intelligible. Effects were a bit thin at times, and they didn’t pack much of a punch, but they came across as acceptably realistic and accurate, and they lacked any significant distortion. Music followed suit, as the score lacked a lot of range. Like the effects, the music was clear enough but it didn’t present much punch. This was a perfectly adequate mix without anything notable on display. Note that the Blu-ray also includes the original monaural audio. I preferred this to the remix, mainly because it seemed a little clearer. The single-channel option gave us slightly tighter music and effects as well as mildly more natural dialogue. Since the 5.1 remix lacked real use of the side/rear channels, I’d recommend the mono track as the strongest listening option. How did the Blu-ray compare to the 2002 DVD version? Audio differed in that the DVD included only the original monaural mix, whereas the Blu-ray offered a new 5.1 remix. It seemed clearer and less rough than the DVD’s audio – and the Blu-ray’s mono track offered definite improvements. Though the Blu-ray’s audio never excelled, it seemed more natural and less distorted than the DVD’s mix. Visuals showed additional improvements. While the DVD looked good for its era/format, the Blu-ray seemed tighter, cleaner and more natural. Across the board, the Blu-ray became the strongest reproduction of the film. The Blu-ray mixes old and new extras, and these start with the DVD’s audio commentary from director Steve Miner, producer Sean S. Cunningham, writer Ethan Wiley and actor William Katt. All four men sit together for this running, screen-specific track. Usually that kind of mass meeting leads to a lively piece, but that wasn’t the case with this fairly mediocre offering. It appears that none of the participants has seen House in quite some time, and their lack of familiarity shows. Quite a few empty spots occur, which is unusual for a commentary with so many participants. Normally the folks involved have to jockey for position, but this one ends up with a fair amount of dead air. When someone does speak, the remarks are often fairly interesting. They mention some good notes about low-budget filmmaking, and there are some fun stories from the set as well. However, a lot of the track follows the participants as they get reacquainted with the movie, and it frequently seems as though they don’t remember it very well. Oddly, they make some factual errors even though they should hear the correct information as they watch the flick. For example, they consistently refer to the aunt character as Roger’s grandmother. Ultimately, this becomes a sporadically interesting but generally flat and slow-paced commentary. New to the Blu-ray, Ding Dong You’re Dead runs one hour, six minutes, 39 seconds. The show features Cunningham, Miner, Wiley, Katt, story creator Fred Dekker, special painting artists William Stout and Richard Hescox, creature effects crew Brian Wade, James Belohovek, Barney Burnbaum, Bill Sturgeon, Shannon Shea, and Kirk Thatcher, stunt coordinator Kane Hodder, special visual effects artist Hoyt Yeatman, composer Harry Manfredini, and actors George Wendt and Kay Lenz. “Dong” looks at the project’s origins and development, story/characters, cast and performances, sets and locations. It also gets into creature design and creation, stunts and visual effects, music, advertising and the film’s release. “Dong” provides a solid overview of the production. The show digs into all the requisite subjects and does so in a compelling way, so it makes up for the sins of the lackluster commentary. Next we find a Vintage Making of> featurette. It goes for 24 minutes, seven seconds and provides comments from Cunningham, Miner, Katt, creature effects designer James Cummins, and actors Richard Moll and Mary Stavin. “Making” mostly discusses story and characters, though it throws in a few production elements. Despite a smattering of good shots from the set, the vast majority of “Making” exists to promote the film, so it remains fluffy and insubstantial. In addition to three trailers and three TV spots, we get a Still Gallery that includes 77 images. Presented as a running six-minute, 54-second montage, we see production photos as well as some advertising/video art. It’s a decent collection. The package finishes with The House Companion, a 148-page book. It offers a long essay by author Simon Barber as well as art, photos, and promotional materials. It gives us a very strong long at the entire House franchise. House offers a somewhat different kind of scary movie, though I don’t think it becomes a successful one. The subject matter seems inappropriate for the light and campy treatment, and the film’s participants can’t take the material to a higher level. The Blu-ray offers generally good picture as well as acceptable audio and a mostly informative roster of supplements. Though the movie leaves me cold, the Blu-ray treats it well. 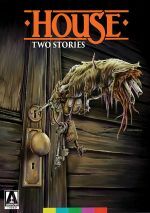 Note that as of April 2017, this House Blu-ray can be purchased only as part of House: Two Stories. This also includes House II and the “Companion” book.